Read the information about mysterious creature Chupacabra that is said to terrify the inhabitants of Mexico and South of the USA. Find out the places where it was recently seen and head for the haunt. They are said to be creatures of myth and legend; stalkers of the night that feed on the blood of the living. But they may also be figments of superstitious minds; conjured through folklore or ignorance, born of fear and propagated by the shadows of night. No matter what they are, these creatures are taking a toll in rural communities of northern Mexico, killing livestock and terrorizing inhabitants, causing a buzz among superstitious locals who already are calling the vampiric visits the work of mythical creatures renowned as chupacabras or "goat suckers". Mythical chupacabras have been reported as far back as the 15th century, or even earlier. 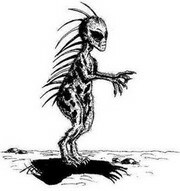 This creature is generally associated with central and South America, they are reportedly part animal/part human, often walking upright like a man and using huge razor-sharp incisors to stalk prey of small animals or isolated human victims, feasting on the blood and not the flesh of its catch. Reports every few months or so are made from varied sites in Mexico and Guatemala concerning a rash of animal killings, usually sheep or goats, that have fallen prey to chupacabras. Frequently several animals are found grouped together, all killed by an unknown attacker. And the flesh of the animals has been untouched while the corpse has been drained of blood. In Northern Mexico the police and federal officials report they are investigating the most recent rash of reports but say they are doubtful they will discover a cause or culprit. Police admit they have no clue as to who or what may be causing the incidents, although they say they have ruled out cult involvement. The most violent of the animal slayings have been occurring near a small village in Chihuahua State where two herders have reported a total of 33 sheep found dead during the full moon of October. As usually the animals were dead without being eaten, but the bodies were drained of blood and two puncture marks were found on each animal's neck. It is still a question whether this creature of myth and superstition. Probably so. But there is definitely something afoul in the Mexican countryside, and so far no one is offering a better explanation. The most recent information about chupacabra came from California, Texas, Miami and Baja California. The creature was reported to be seen many times in Mexico as well. The first attack of chupacabra was registered in Tucson, Arizona, where it attacked two goats. The owner described the creature as a huge rat-like creature that let out a shriek when detected and ran away. In Baja California a dog was found with two marks resembling needle pricks on the neck. There were 69 animals of farmers killed overnight in Miami.